Before performing a baptism, the priest approached the young father and said solemnly, "Baptism is a serious step. Are you prepared for it?" "I think so," the man replied. "My wife has made appetizers and we have a caterer coming to provide plenty of cookies and cakes for all of our guests." 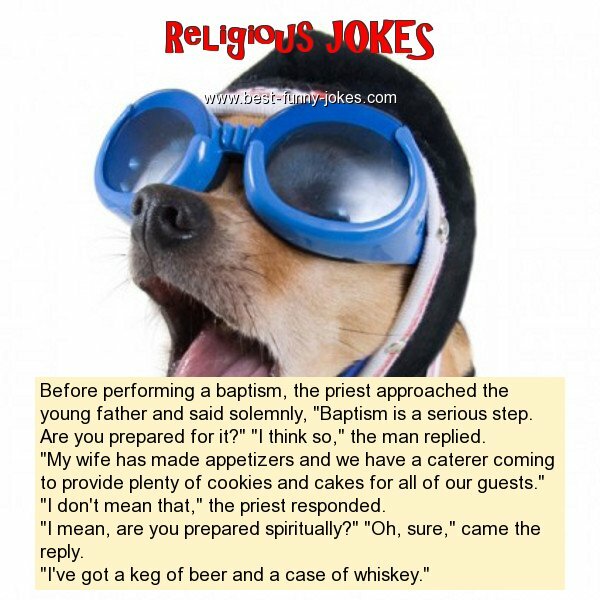 "I don't mean that," the priest responded. "I mean, are you prepared spiritually?" "Oh, sure," came the reply. "I've got a keg of beer and a case of whiskey."